In Clades, sauropsids of the air are represented by birds. Today’s birds all descend from a species of flying theropod dinosaur that lived before the Cretaceous-Tertiary extinction event of 70 million years ago. Unlike today’s common birds, these early birds did not perch in trees. Four bird lineages survived the extinction event that wiped out the other dinosaurs. One surviving lineage led to today’s ostriches and their close relatives (Paleognatha, or “old jaws”). The other lineage, the Neognatha or “new jaws”, survived in three separate lines, one leading to ducks and fowl, another to sea gulls and their relatives, and the third to “earth birds” (Telluraves). Telluraves predominate today, and they mostly perch and nest in trees. 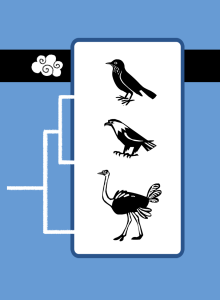 Telluraves split into Afroaves (or “African birds”) and Australaves (or “southern birds”), represented in Clades by a bald eagle and an American robin, respectively. The common ancestor of all eagles and robins was evidently a carnivorous bird that perched on tree branches. “Old-jaw” birds and “new-jaw” birds together form the clade Aves, or birds. If one includes the many birdlike dinosaurs that didn’t survive the last extinction event, this larger clade is called Avialae (“bird wings”). Archaeopteryx are in the clade Avialae, but they are a separate branch from Aves.